The commercial nuclear industry is in the midst of developing multiple reactor technology options. Next in our series of articles exploring competing reactor technologies are GE Hitachi Nuclear Energy’s Advanced Boiling Water Reactor (ABWR) and Economic Simplified Boiling Water Reactor (ESBWR). The design improvements incorporated into these reactors include passive safety systems, design and construction simplification, and component standardization to reduce construction and operating costs. Title 10 of the Code of Federal Regulations, Part 52, Licenses, Certifications, and Approvals for Nuclear Power Plants (10 CFR 52), promulgated by the U.S. Nuclear Regulatory Commission (NRC), provides a standardized licensing process for new nuclear plant designs. This process involves reviewing and certifying standard reactor designs independent of a specific site. A design certification is valid for 15 years from the date of issuance and is renewable for an additional 10 to 15 years. The certification process requires reactor vendors to provide sufficient technical information to demonstrate compliance with the NRC safety standards, such as those concerning radiation protection, physical protection of the plant and materials, and environmental impacts. 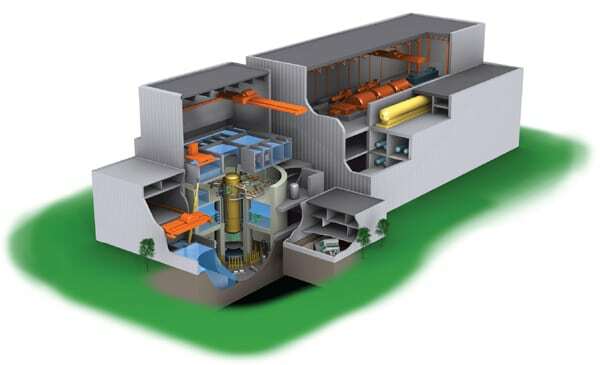 This process not only encompasses the industry’s decades of experience and research involving reactor design and operation but also allows for early public participation and resolution of safety issues prior to a utility submitting an application to construct a new nuclear power plant that uses a particular reactor technology. Reactor designs have evolved substantially since the last reactor entered service in the U.S. almost 15 years ago, principally with regard to simplified, passive, or other innovative safety functions. The new designs combine these improvements in safety with design simplification and component standardization to produce a safer and more reliable nuclear power plant with competitive life-cycle operating costs. Two examples of these new reactor designs are GE Hitachi’s (GEH’s) Advanced Boiling Water Reactor (ABWR) and its later incarnation, the Economic Simplified Boiling Water Reactor (ESBWR, Figure 1). 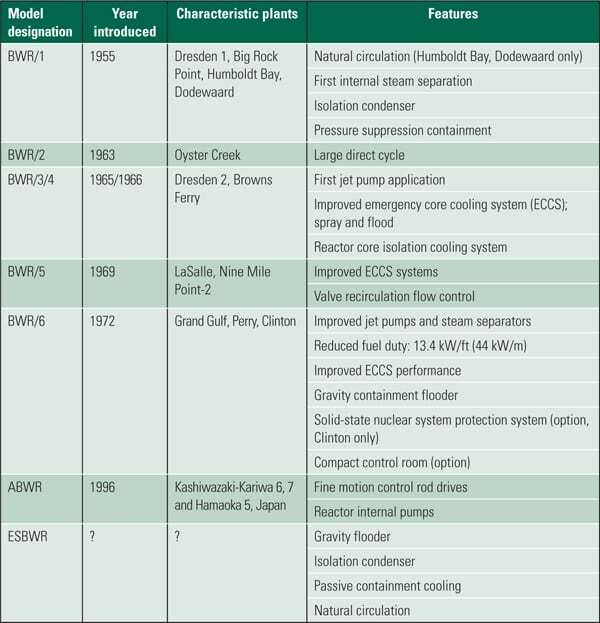 A more detailed summary of the boiling water reactor’s (BWR’s) history can be found in Table 1. See the sidebar “General Electric’s Nuclear History” for background on GE’s nuclear business alliances. The NRC certified the ABWR design in May 1997, allowing that reactor to be referenced thereafter in an application for a combined license (COL) to build and operate a new nuclear power plant. The ABWR is a GE Nuclear Energy (GE)–designed, single-cycle, forced-circulation BWR with a rated power of 3,926 MWt. General Electric (GE) entered the commercial nuclear industry in 1955 with the formation of its Atomic Power Equipment Department. This new business developed and patented a reactor design known as the boiling water reactor (BWR), and in 1957 the U.S. Atomic Energy Commission granted GE a license to operate the developmental Vallecitos BWR at its Vallecitos Nuclear Center near Pleasanton, Calif. GE subsequently designed and supplied the Dresden Nuclear Power Station for Commonwealth Edison Co., which went into operation near Chicago in 1960. Over the ensuing 50 years, the company designed and supplied nine generations of BWR technology for customers worldwide. Today, the majority of BWRs around the world are based on GE’s designs. In 2000, GE and its technology licensees, Hitachi Ltd. and Toshiba Corp., combined their nuclear fuel businesses into a joint venture called Global Nuclear Fuel (GNF). GNF’s primary business involves designing and fabricating nuclear fuel assemblies and providing related services for BWR nuclear power plants. GNF has manufacturing facilities in Wilmington, N.C., and Kurihama, Japan. 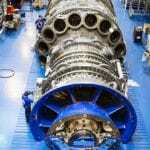 GE holds the majority ownership interest in, and has effective control of, GNF. Also, GNF has majority ownership interest in a joint venture with Enusa Industrias Avanzadas, S.A. to market and supply fuel to BWR nuclear power plants in Europe. In 2007, GE and Hitachi Ltd. formed a global alliance combining elements of their nuclear power businesses (excluding the previously formed GNF joint venture). Outside Japan, the alliance is known as GE Hitachi Nuclear Energy (GEH) and is based in Wilmington, N.C. GEH’s primary business is designing and supplying BWRs and servicing both boiling water and pressurized water reactors. There is also a Canadian legal entity, GE Hitachi Nuclear Energy Canada Inc., that supplies fuel to and services nuclear power plants that use the pressurized heavy water reactors designed by Atomic Energy Canada Ltd. (For more information on the CANDU nuclear plant designs, see “Bruce A Proves There Are Second Acts in Nuclear Power,” August 2010). Whereas GE has the majority ownership interest in, and effective control of, the legal entities constituting the alliance outside Japan, Hitachi has majority ownership and effective control in Japan. Also in 2007, GE and Hitachi Ltd. formed GE Hitachi Global Laser Enrichment (GLE) to develop and deploy laser technology to enrich uranium for use in nuclear power plants. In 2008, Cameco Corp. acquired an interest in GLE. GE has the majority ownership interest in, and effective control of, GLE. 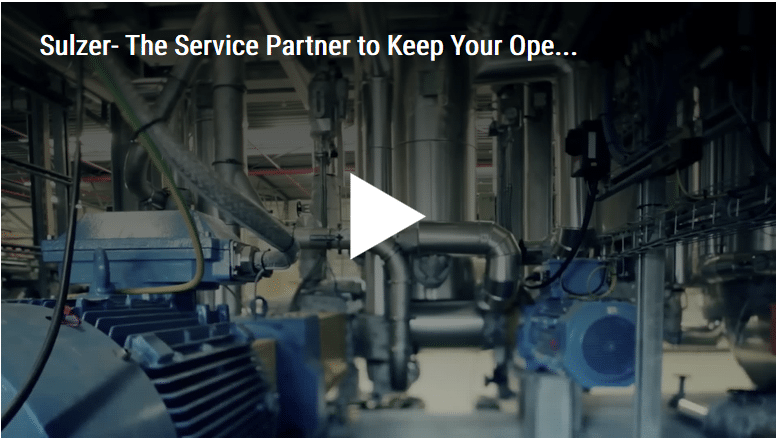 In addition to these companies, a number of GE’s other businesses supply products and services to its nuclear power business, including steam turbines, sensors, water treatment services, and other electrical equipment. The design incorporates features of earlier BWR designs used in Europe, Japan, and the U.S. but adds improved digital electronics and computers, steam turbine, and fuel technology. A few of the many reactor-specific improvements include the use of internal recirculation pumps, fine motion control rod drives that can be controlled by an electric motor–driven screw mechanism (rather than a hydraulic-driven step process), microprocessor-based digital control and logic systems, and digital safety systems. The design also includes safety enhancements, such as protection against overpressurizing the containment vessel, passive core debris flooding capability, an independent water makeup system, three emergency diesel generators, and a combustion turbine as an alternative backup power source. Thirty-five of the 104 operating reactors in the U.S. are BWRs; 14 BWR plants have a single reactor, nine have two reactors, and one plant has three reactors. The World Nuclear Association database lists 50 GE BWRs in operation worldwide. GE lists 66 BWR units of all sizes that have been constructed (for example, Humboldt Bay Nuclear Power Plant was a 63-MW plant that was permanently shut down in 1976). The difference appears to be those reactors that have been removed from active service. The ABWR is the foundation of GEH’s nuclear reactor portfolio and reflects 50 years of continued evolution, from GE’s initial BWR/1 concept in 1955, to designs combining the best features from its worldwide BWR fleet, to its latest builds in Japan. (The last BWRs constructed in the U.S. were Generation II BWR/6 models.) Table 2 lists those U.S. companies that have announced plans to use the ABWR or the ESBWR in their future nuclear plant builds. The best examples of the success of the ABWR design are the two units at Kashiwazaki-Kariwa (Units 6 and 7) in Japan. These two units, built in 1996 and 1997, were the first ABWRs and the first Generation III reactors to begin commercial operation in the world (Figure 2). 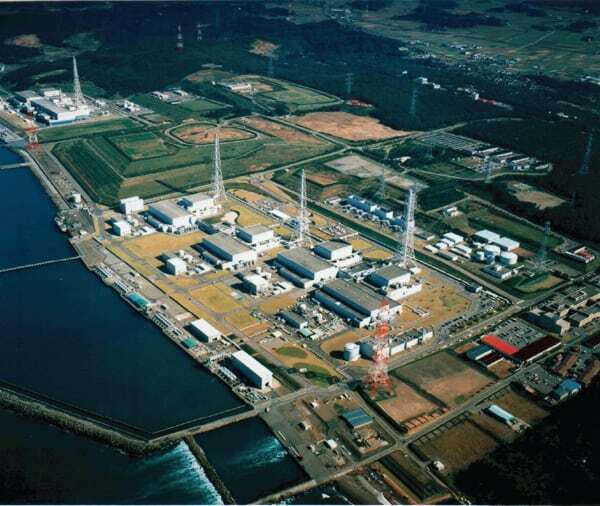 Since then, two additional plants (Hamaoka Unit 5 and Shika 2) have entered commercial service in Japan, two plants are under construction in Japan, and two plants are under construction in Taiwan that are identical to the Kashiwazaki-Kariwa design. According to GEH, nine more units are planned in Japan and seven units are under active consideration in the U.S. (Table 3). 2. Made in Japan. The Kashiwazaki-Kariwa Nuclear Power Station began operation in September 1985. By 1997, seven units were in commercial operation with a total capacity of 8,212 MW, making it the largest nuclear power station by capacity in the world. The plant is located in Niigata Prefecture, approximately 130 miles northwest of Tokyo, along the coast of the Sea of Japan. Courtesy: Tokyo Electric Power Co. Reactor internal pumps added to the bottom of the reactor pressure vessel improved safety and performance by eliminating external recirculation systems. An integrated containment and reactor building improved seismic response and is more compact, thus reducing the amount of construction materials required and the time required to construct the building. A digital reactor protection system included multiple digital and manual backup systems with fully automated start-up and shutdown capability. The plant design is modularized to reduce construction time and cost. Fiber optic data channels replaced miles of copper wires. High-integrity fuel, improved water chemistry, and eliminating radiation sources reduced radwaste and occupational radiation exposure. The ESBWR is a Generation III+ 4,500-MWt/1,590- to 1,690-MWe natural circulation BWR but with a further simplified, inherently safe reactor design (Figure 3). GEH believes this simpler, standardized design will further reduce capital cost and construction time in addition to lowering operating and maintenance costs compared with the ABWR design. The greatest departure from earlier reactor designs is the incorporation of “passive” safety features, which rely on natural forces such as gravity, evaporation, and condensation rather than “active” systems, which rely on large numbers of powered pumps and motor-operated valves in the event of a reactor malfunction. The ESBWR program started in the early 1990s with GE’s Simplified Boiling Water Reactor (SBWR) design rated at 670 MWe, augmented with features taken from the NRC-certified ABWR. GE submitted the SBWR application for final design approval and design certification to the NRC in August 1992. The NRC, in May 1993, determined that it was acceptable for review. In response to some NRC concerns, GE sponsored testing of passive safety equipment that continued into 1996. However, GE announced its withdrawal of the design certification application in March 1996 because the power output of the SBWR was too small to produce acceptable economics for a new-build project. 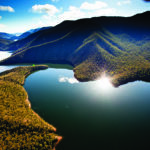 Instead, it shifted its focus from the SBWR program to plants of 1,000 MWe or larger, such as the ABWR and ESBWR. At GE’s request, the NRC closed out its SBWR review activities in early 1997. Since that time, GEH has been diligently developing sources for key nuclear components (see sidebar “Building the Nuclear Supply Chain”). Notably, the key passive safety technology enhancements developed as part of the SBWR program were merged into the new ESBWR program. The ESBWR core was also increased in size by adding fuel assemblies to increase power level. Fuel height was decreased to 3.0 meters in order to achieve the appropriate pressure drop, while the power density was set to 54 kW/liter. The core increased from the 732 fuel assemblies in the SBWR to 1,132 fuel assemblies in the ESBWR, resulting in a thermal power rating of 4,500 MWt. 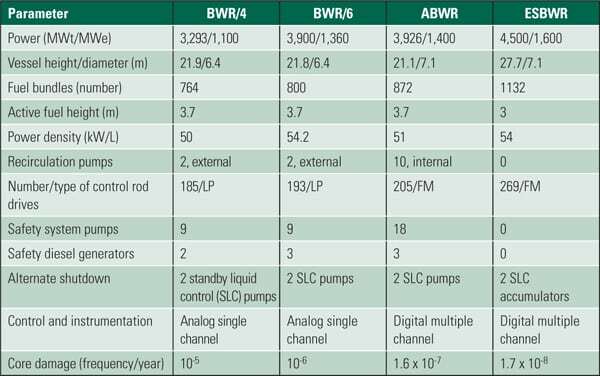 Table 4 summarizes additional ESBWR design features compared with the ABWR design. 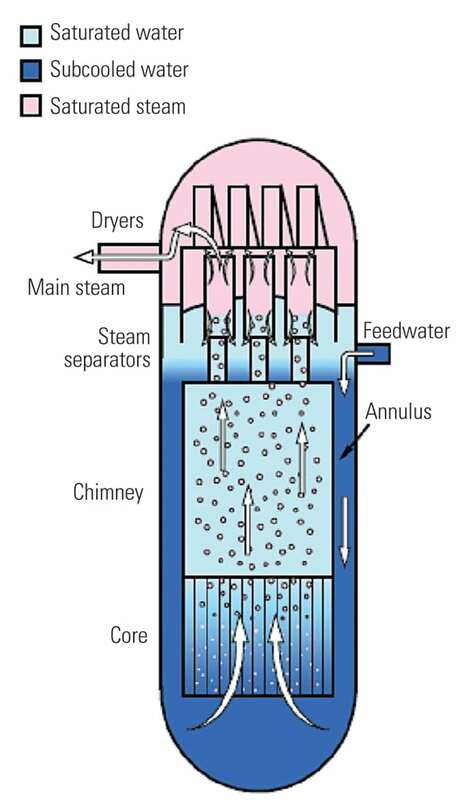 A partitioned chimney above the reactor core to promote natural circulation flow and to direct the steam and water flow above the core. 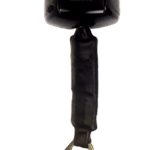 A correspondingly taller, open downcomer annulus that reduces flow resistance and provides additional driving head, pushing the water to the bottom of the core. Valuable operating experience was gained from early natural circulation BWR designs, such as the Humboldt Bay plant in California, which operated for 13 years, and the 58-MW Dodewaard plant in the Netherlands, which was shut down in 1997 after 30 years of operation. Both were BWR/1 plants (see Table 1). Today, large (>1,000 MW) BWRs can generate about 50% of rated power in natural circulation mode. The operating conditions in this mode—power, flow, stability, steam quality, void fraction, void coefficient, power density, and power distribution—are predicted by GEH calculation models that were calibrated against operating plant data from LaSalle, Leibstadt, Forsmark, Confrentes, Nine Mile Point 2, and Peach Bottom 2 plants. Therefore, natural circulation is consistent with the key objectives of the ESBWR program: a passive safety design with simplification achieved by evolutionary enhancements. 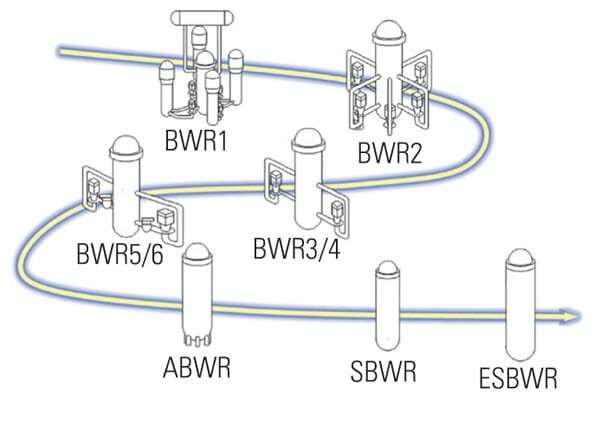 Most features of the ESBWR have been taken directly from licensed commercial BWRs, then reviewed and redesigned, as appropriate, for the ESBWR. Because there are fewer active components and active safety systems, maintenance and online surveillance requirements are reduced, thereby reducing operational radiation exposure and dose rates as well as low-level waste volumes. Moreove r, the design places fewer demands on plant operators and safety systems while still providing direct improvements in accident and transient response. As a result, operational reliability, plant safety, and security are all improved. GEH custom fabrication facility, Canonsburg, Pa. This supply chain program is augmented by other countries where nuclear power plant projects are being developed. Equipos Nucleares S.A. (Ensa) of Spain, for example, will become a key supplier of reactor pressure vessels (RPVs) under a strategic agreement with GEH. In order to fabricate the ABWR and ESBWR RPVs, Ensa is upgrading its facilities, which includes increasing crane capacity from 900 to 1,300 metric tons, increasing radiographic testing capacity, and enlarging related systems and equipment. Ensa, part of the state-owned holding company SEPI Group, designs, manufacturers and installs heavy components and other major equipment for nuclear power plants, such as reactor vessels and their internal components, steam and pressure generators. It also provides services for thermal power plants and other facilities. The company operates a facility in Maliano, on the northern coast of Spain, and currently exports 85% of its production. 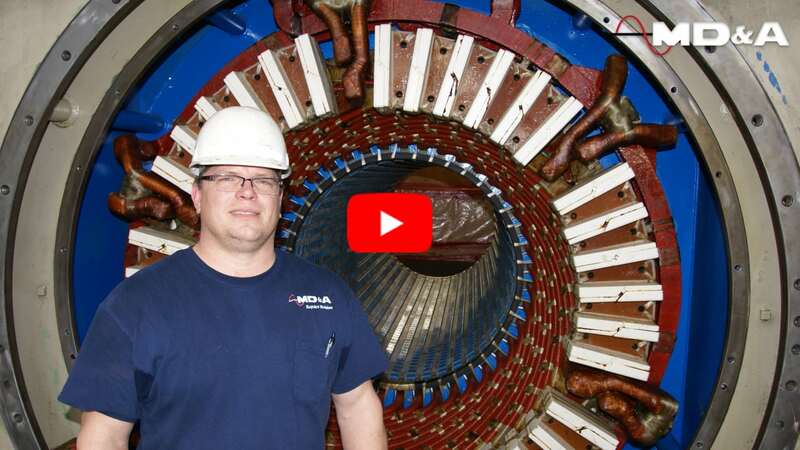 It manufactures components and equipment for nuclear power plants in several countries, including the U.S., China, South Korea, South Africa, France, and Sweden. In February 2009, Japan Steel Works supplied Ensa with the first of six forgings required to fabricate one ESBWR reactor pressure vessel. Ensa anticipates completing the RPV manufacturing process by mid-2012. In May 2010, GEH signed a preliminary agreement with the global engineering services firm SNC-Lavalin Polska to collaborate on new supply chain and commercial nuclear power plant construction opportunities in Poland. This is the second memorandum of understanding GEH has signed to support Poland’s commercial nuclear construction initiative. In March, GEH and PGE Polska Grupa Energetyczna SA (PGE), Poland’s largest power company, announced an agreement to collaborate on plans to build next-generation commercial nuclear power plants. GEH and SNC-Lavalin Polska are continuing their discussions in support of PGE as the utility evaluates the potential of building up to four reactors based on one of two GEH reactor designs: the ABWR or the ESBWR. In August 2010, GEH signed a preliminary agreement with India’s Tata Consulting Engineers Ltd. to explore potential project design and workforce development opportunities. India’s government has identified two possible sites for a potential new station featuring multiple reactors based on GEH’s ESBWR model. The sites are located in the western state of Gujarat and southern state of Andhra Pradesh. India currently has 19 reactors that generate a combined 4,560 MWe but plans to expand its installed nuclear generating capacity to 20,000 MWe by 2020 and to 63,000 MWe by 2032. Postulated loss-of-coolant accidents are mitigated in the ESBWR because the vessel can be depressurized rapidly to allow the injection of low-pressure makeup water from multiple sources. The passive safety-grade makeup water flows into the vessel by gravity from the gravity-driven cooling system, instead of relying on pumps and their associated support systems. Containment cooling is also provided by a passive system. In addition, operator response times for all hypothetical events have been relaxed from minutes for previously licensed reactors to days for the ESBWR. An isolation condenser system is used for high-pressure water level control and decay heat removal during reactor isolated conditions, such as those that could occur during a station blackout event. It passively transfers residual decay heat to the atmosphere. Anticipated transient events are milder for the ESBWR and do not require safety-relief valves. As a backup, the automatic depressurization system and gravity-driven cooling system can operate to provide low-pressure water level control. Another important design feature concerns the core damage frequency (CDF), an expression of the likelihood that, given the way a reactor is designed and operated, an accident could cause damage to the fuel. According to GEH data, the ABWR has the lowest CDF of any Generation III reactor on the market and is beaten only by the ESBWR. For perspective on CDF, a 2008 EPRI study estimated the CDF for the U.S. nuclear industry at 2 × 10−5 (per reactor year). Overall, industry CDFs have dropped by nearly 40% since 2000 and by nearly a factor of five since 1992. The downward trend in CDFs is a result of industry performance: preventing significant safety events from occurring, sustaining record-breaking capacity factors, and conducting inspections that translate directly into reduced plant risk levels. As of September 2010, the ESBWR was in the final stages of the NRC’s design certification technical review process, and the final rule is expected by September 2011. Receipt of NRC approval is required prior to inclusion of the ESBWR as part of a COL in the U.S. Table 5 summarizes the key milestones in the schedule that the NRC has established for its review of the ESBWR application. — James M. Hylko (jhylko1@msn.com) is a POWER contributing editor. Dr. Robert Peltier, PE is editor-in-chief.